A linear regression / classifier can absolutely be overfit if used without proper care. There should be no relation between our flips y and our random classes rand.class, they were determined completely independently. The true value of every one of these coefficients is zero. But as you can see, we have quite a spread. This linear classifier is for sure overfit. 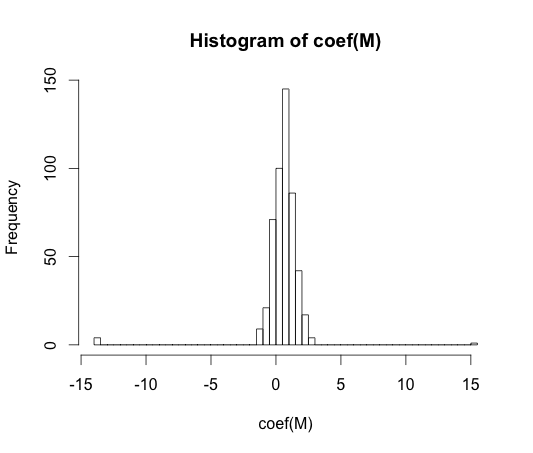 Note: The extremes in this histogram, where the coefficients have wandered to $-15$ and $15$, are cases where a class had either no observations with y == 1 or no values with y == 0. The actual estimated values for these coefficients are plus and minus infinity, but the logistic regression algorithm is hard coded with a bound of $15$. "overfitting" does not seem to be formally defined. Why is that? Overfitting may be best understood within the context of a class of models which has some complexity parameter. In this case, a model could be said to be overfit when decreasing the complexity slightly results in better expected out of sample performance. It would be very difficult to precisely define the concept in a model independent way. A single model is just fit, you need something to compare it to for it to be over or under fit. In my example above this comparison was with the truth, but you usually don't know the truth, hence the model! Wouldn't some distance measure between training and test set performance allow for such a formalisation? where $E$ stands for error, and each term is averaged over all possible training and testing sets for your learning algorithm. It doesn't quite get at the essence of overfitting though, because the performance on a test set can be quite a bit worse than the train, even though a model of higher complexity decreases both. In the 70-ties, experiments with pattern recognition algorithms on large datasets revealed that adding extra features did in some cases increase the test-set error rates. This is counter intuitive because one would expect that adding an extra feature always increases classifier performance, or in case that the added feature is 'white noise', its addition does not influence classifier performance at all. The effect of adding still more extra features to a classifier, eventually leading to a decrease in test-set performance became known as the peaking phenomenon . Feature peaking is caused by over-generalization during learning. The extra features cause the inclusion of so many additional parameters that the classifier begins to overfit the data. Hence, the peaking point is passed. In general, we face a bias-variance trade-off when training classifiers. The more feature-variables we use, the better will the (unknown) underlying classifier mechanism possibly be modelled by our classifier. Hence, the systematic deviation between fitted model and 'truth' will lessen, i.e. a smaller bias results. On the other hand, increasing the feature space of the classifier necessarily implies the addition of parameters (those that fit the added features). Thus, the variance of the fitted classifier increases too. So the classifier exeeding the peaking point is just one stochastic realization of a high-dimensional classification problem, and a new fit will result in a highly different parameter vector. This fact reflects the increased variance. I think that overfitting refers to model complexity rather than generalization ability. I understand the quote "a linear classifier cannot be overfitted" since its complexity is small, and there is no other simpler classifier providing a better performance. Like @match-maker-ee said, Linear classifiers can over-fit depending on the input features. SVM's can also over-fit, for example when they use the kernel trick, despite being basically a linear model in an augmented feature space. Not the answer you're looking for? Browse other questions tagged classification overfitting or ask your own question. How can training and testing error comparisons be indicative of overfitting? Why do we have to be concerned about the problem of overfitting on the training set? Why regularize all parameters in the same way? Higher overfitting using data augmentation with noise?